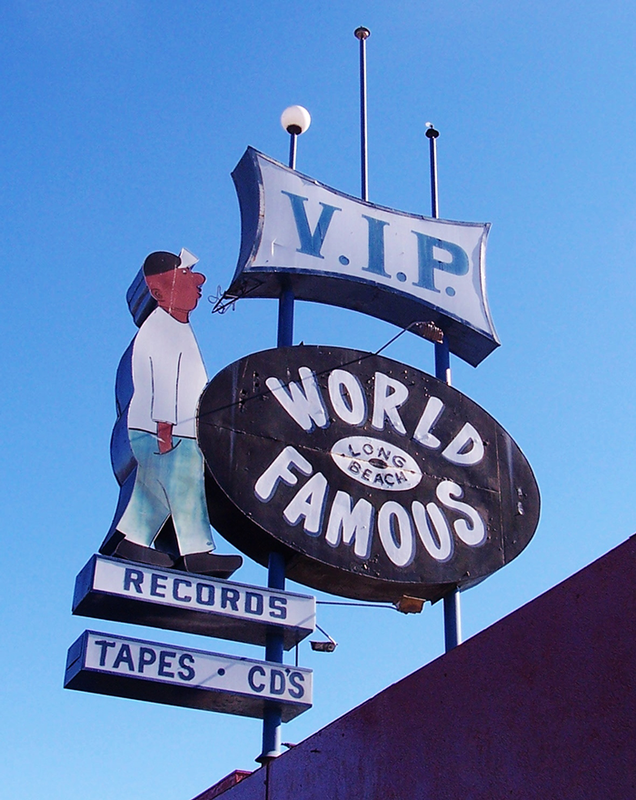 UPDATE | The World Famous VIP Records sign saga added another chapter to what has been a flurry of changes over the past few weeks as the record store owner and operator Kelvin Anderson announced yesterday that an agreement on the fate of the iconic sign had been reached with the city. In a Facebook post Wednesday evening, Anderson is pictured with Mayor Robert Garcia who’s holding a VIP Records T-shirt. He thanked the community for its show of support over the past few weeks. Anderson did not elaborate on the agreement in his post. Anderson and supporters had turned out to the Tuesday night Long Beach City Council meeting to ask the mayor to halt a historic preservation application from moving forward, one that Anderson believed would have stripped him of any rights to the sign that had served as a beacon for his iconic record shop for nearly four decades. The confusion Anderson referenced stemmed from his belief that the city was trying to “illegally” designate the sign for preservation. If it were to have been designated as historic—it was slated for a vote before the Cultural Heritage Commission next month—it would’ve made it extremely difficult for anyone to move, alter or sell the sign without permits from the city. Shirin Senegal, the vice president of VIP Records branding, said that preservation has been put on hold while Anderson weighs his options. She said Anderson is keeping open the possibility that the sign could be designated for historic preservation but the team wanted to sit down and explore the pros and cons before the process moves forward. Senegal said the group is going to look for a property for a hip-hop museum, something that Anderson said was his goal after announcing the closure of his record store in late 2015. If they are able to secure a space for a museum, the sign could potentially be moved there and be restored, something the city had previously expressed would be acceptable so long as the museum is in Long Beach. 3/15/17 at 7:07AM | Just two weeks after launching an online petition to pressure the city to help in designating the World Famous VIP Records sign as a historic landmark, the owner of the record store has launched a separate petition seeking to block what he’s calling the city’s “illegal” attempt to brand the iconic sign with historic status. 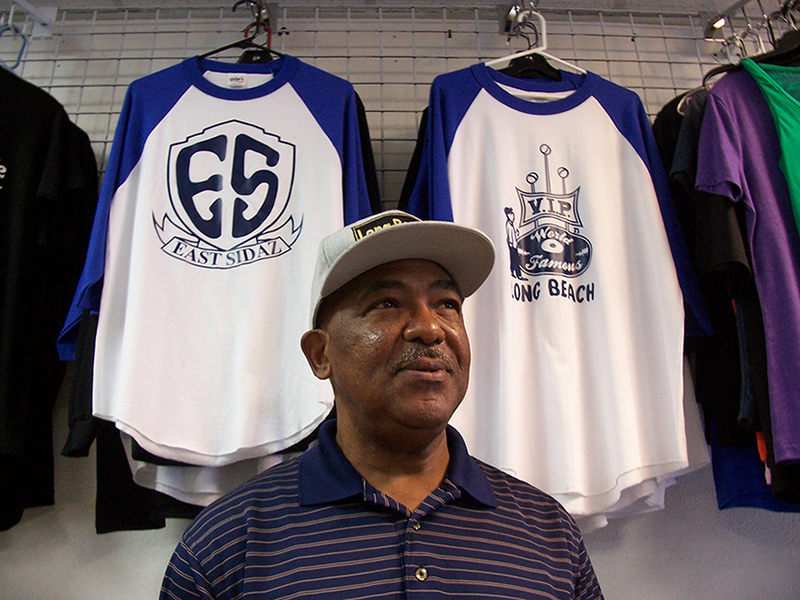 Kelvin Anderson, owner and operator of VIP Records for nearly 40 years, claims that Mayor Robert Garcia and the city are proceeding with an attempt to classify the sign—made famous when it was featured in the 1993 music video for Snoop Dogg’s “Who Am I (What’s My Name)”—as historic, which could effectively strip him of any rights he has to the sign. Anderson paid for the erection of the sign but does not own the property or the building that it currently sits atop of near the intersection of Pacific Coast Highway and Martin Luther King Jr. Avenue. In an interview with Post, Vice President of VIP Records Branding Shirin Senegal said that the city’s efforts to get the sign and the site listed as a historic landmark began in December 2015 after Anderson had announced the closure of the record store and listed the sign for sale on Ebay. The sign, according to Senegal and the petition, garnered nearly $200,000 in bids before Anderson removed it at the city’s request as negotiations to decide the fate of the sign took place. However, those negotiations, Senegal said, were sporadic and eventually broke off. Anderson was informed last week that an application to have the original building where the record store existed—Anderson had relocated to a smaller unit in the same strip mall some years ago—and the sign was being processed with a hearing before the city’s Cultural Heritage Commission (CHC) scheduled for April to have the sign designated as a landmark. “It was very clear and evident what the intention was, to keep that man from moving his own sign because it’s a resource to the city of Long Beach,” Senegal said. In a letter obtained by the Post Tuesday, Offer Grinwald, an officer representing the LLC that owns the building, states that he was contacted by a city representative in early 2016 to encourage him to apply for preservation of the sign, although at the time he was unsure of what that entailed. Grinwald said he had requested the application to be pulled a few months later and was under the impression that the process had been stopped until he received a letter from Christopher Koontz, an advanced planning officer with the city, notifying him of the April 10 hearing before the city’s CHC. Reached Tuesday afternoon, Koontz said he was unaware of the letter, but noted the item has been removed from the commission’s April calendar. The hope being that time will allow cooler heads to prevail and allow for all parties to come to the table again to work toward an amicable solution. He also confirmed that a provision in the city’s municipal code allows for the city to designate property as a historic landmark, even without the owner’s consent. The ordinance Koontz is referring to was approved in August 2015 when the Long Beach City Council voted 8-0, with councilmember Suzie Price absent, to adopt a recommendation backed by the CHC that explicitly left out a provision to require owner consent when undertaking such a process. A competing recommendation advocated by city staff included owner consent as a requirement for historic preservation status. To be clear, it is not uncommon for local ordinances to forego owner consent in creating historic status for privately owned properties. Several cities in Los Angeles County and nationally have adopted similar provisions as Long Beach did in 2015. At the August 2015 meeting, Director of Development Services Amy Bodek said that the staff’s recommendation did not put potentially historic properties at risk of accidental demolition as a new database, and required procedural reviews would give the city ample time to respond to owners who filed for demolition of properties the city saw as worth preserving. A friendly amendment by Fifth District Councilwoman Stacy Mungo accepted by then-Vice Mayor Suja Lowenthal allowed for property owners to be noticed before the CHC meeting, as is the case with Anderson’s VIP Records sign. At the time of publication, Anderson’s petition has received over 1,800 signatures since it was launched and during Tuesday night’s city council meeting he and a handful of his supporters spoke to the council asking for a resolution to the issue. Mayor Robert Garcia declined to comment for this story but announced at the council meeting that he and Anderson were meeting Wednesday to discuss the matter privately. Koontz says the city feels that a solution can be reached as there is a common goal: ensuring the sign’s long-term health and preserving its cultural and historic importance. Senegal says Anderson wants to take the sign down to have it restored before hopefully returning it to Long Beach. He has had his sights set on opening a rap and hip-hop museum since he announced his final closure of VIP in December 2015. Koontz says a situation like that would appease the city, so long as the sign remains in Long Beach.